Over the first weekend in November we crammed DoES Liverpool with around fifty hackers, artists, geeks and designers and tasked them with coming up with interesting and new ideas for connecting the real world at the Internet of Things Howduino. Before the event, my biggest concern was that people wouldn't have come up with suitable projects to work on over the weekend. To try to encourage the creative juices I asked a couple of Internet of Things luminaries to come up with briefs to push people beyond the usual temperature monitors. As you'd expect, Usman Haque - founder of IoT service Cosm.com - and Alexandra Deschamps-Sonsino - CEO of Good Night Lamp - didn't disappoint and after the intro we kicked off the "what are you going to make?" discussion with a read through their proposals, plus a couple of more basic ones that I'd added. However, I needn't have worried as about half of the attendees already had plans and ideas of their own on what they were going to work on. There was some overlap between ideas, and there was soon a real buzz to the plans being made. There was no time to lose, and so everyone found a table or a corner of the workshop and got on with making things. 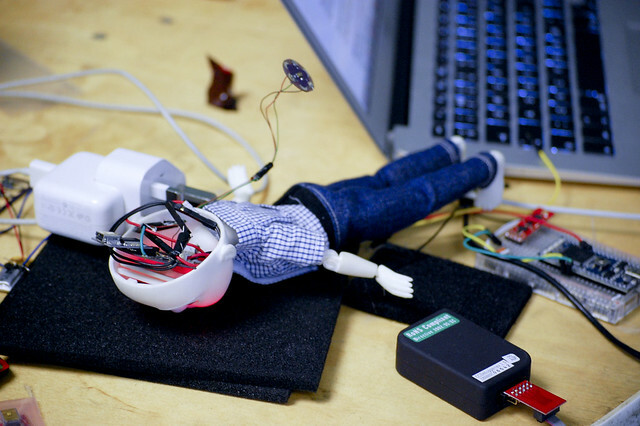 A few people had brought things along that they were looking for help in hacking: the guys from Makielab had some of their cool 3D-printed dolls which they were looking to animate - there's a picture of one undergoing brain surgery above; John McKerrell was looking for different directions to push his existing WhereDial IoT location clock (more on that later); and Shaun Myhill from Electric Imp had some of their Imps to easily Internet-of-Thingsify anything, and was helping anyone who was interested do just that. Cefn Hoile, one of the Howduino crew, also had a load of his super-cheap Arduino-compatible Shrimp kits, and led a packed session on the Saturday afternoon to get most of the attendees up and running with the first Arduino they'd built from bare components. The Sunday saw more of the same, with the wrap-up being delayed a little to give everyone more time to work on their projects. Even with that, the show-and-tell seemed to come around faster than anyone wanted. 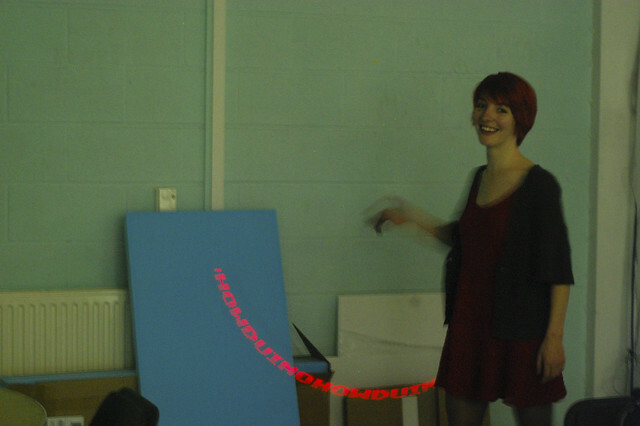 The consolation though was getting to see all the cool things that had been created in the space of a weekend! In no particular order, here are the projects presented at the end of the event. Some of the attendees could only make it to the first day, and we didn't manage to capture their work. It would've been nice to video them so that we could have included them in the wrap-up, but we only thought of that on the Sunday. Ah well, next time. After realising there wasn't time to get her laser-cut garden planting calendar finished, Clare Bowman extended her Shrimp board (with a bit of help from Cefn) to provide a persistence-of-vision display. Some last-minute hacking during the show-and-tell(!) saw it fastened into a plastic bag to enable the Poi demonstration captured in the photo above. Despite going down with a migraine on the second day, Lisa Böhm (with assistance from Jodi Schneider) managed to get the twitter side of her Social Media Shelves project up and running. The aim is to pimp her set of Ikea shelves with different LED lighting in each compartment, which will react whenever there's activity on her assorted social media profiles. Jen Allanson arrived at Howduino not knowing anything about electronics or coding but with a vision of an interactive fortune-teller machine, like the Zoltar machine in the movie Big. By the time she left, the first stage was complete, with the mechanism to recognise someone approaching completed. Antony McLoughlin took an idea he'd come up with during Barcamp Liverpool and turned it into a running prototype - getting the furthest of all the Electric Imp hacks. A light sensor was hooked up to the Imp, which then posted the data through to a Cosm feed. When the light level dropped below a set threshold (showing that the windows were dirty) that would then tweet an alert. Mark Holmes and Paul Freeman (in between their duties helping run the event) started to create some sensors that can monitor the status of the soil in your garden. 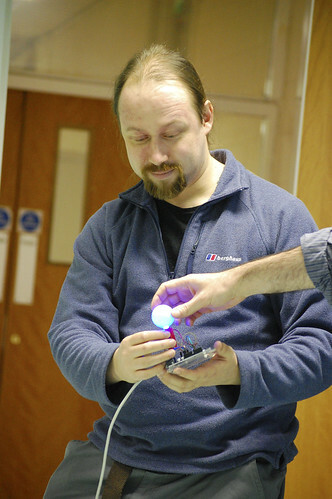 You can see Paul demonstrating their RGB LED display with its ping-pong ball diffuser below. Ulitmately the whole thing will be hooked up to a dashboard allowing you to monitor your garden either using the lights or the dashboard. Although he seriously overestimated the number of hours in a weekend - Patrick Fenner got the grid to house the LEDs for his word clock laser-cut and wired up the array of charlieplexed LEDs inside, but ran out of time to get the software written to drive them or to query an NTP server to get the time from the Internet. Pat Link took the opportunity to do more work on his Shrimp-powered Simon Says game. He teaches technology and is looking for ways to get young people interested in building things. There's a video where you can see it in action. Yuwei Lin worked on a piece to help you see which films were on at FACT or the Cornerhouse (the arthouse cinemas in Liverpool and Manchester) and which languages they were in. Users would be able to use it to see what's on, and compare cinemas. The first step was a series of coloured LEDs that show the language of a film - stage 2 will allow you to compare different cinemas in cities across the country. Simon Dunton spent the weekend turning a Raspberry Pi into an Internet-connected remote control for some mains plug sockets. Rather than mess around with any dangerous mains voltages, he bought some cheap RF remote control plug sockets and hacked the remote so he could control it from his Pi. Finally, a big thanks to Andy Goodwin, Cefn Hoile, Paul Freeman and Mark Holmes for helping organise and run things; to LJMU Openlabs and ACME/Kin2Kin for sponsoring; to Thom Shannon and Glow New Media for extra Internets; and DoES Liverpool for providing the venue. And a massive things to everyone who came along, built things, learnt things and provided such a buzzing atmosphere of making.